Sign into eHive by clicking the Sign In button on the top right corner of the screen. Enter your eHive ID and password and then click the blue Sign In button. Remember, eHive IDs and Passwords are case sensitive. You can enter my.eHive.com in your web browser to go directly to the Sign In Page. This is a good page to bookmark/save in your web browser. What if I forget my details? Your eHive ID was emailed to your designated email address when you signed up, and should be kept somewhere safe and secure for future reference. Click the ‘Forgot your eHive ID’ link. Enter the email address you used during the sign up process, then click the ‘Request eHive ID’ button. Your eHive ID will be sent to the email address you provided. Go to the Sign In page and click the ‘Forgot your password’ link. 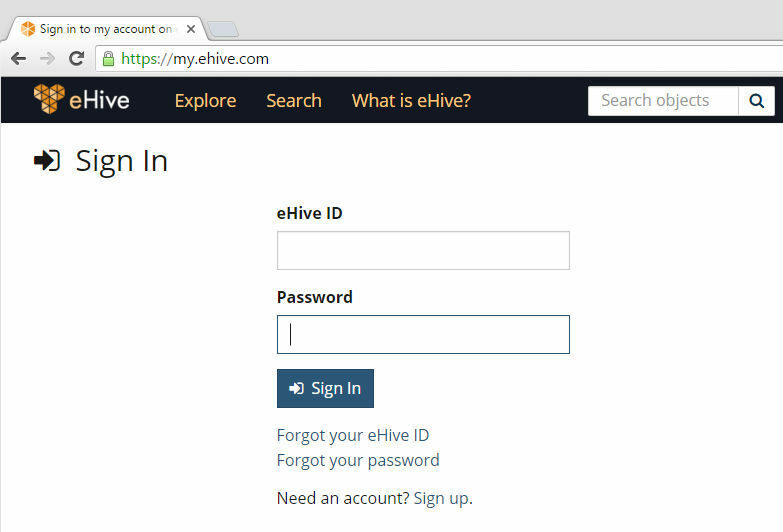 Enter your eHive ID and the email address you used during the sign up process. Click the ‘Request password reset’ button. An email will be sent to this address containing a link to reset your password. Click on the link and enter a new password for your account. If you do not receive this email please check your spam and junk mail folders. When you sign in to eHive, your web browser may ask if you would like it to remember your eHive ID and password. This may mean that your eHive ID and password will automatically be filled in when you sign in, and that others could access your account if they are using your computer. Please consider carefully if you want your web browser to remember your eHive ID and password. This could compromise your account security if you are using a shared computer. To sign out of eHive, select the Sign Out link in the top right hand corner of any eHive screen. Once you have signed out of eHive, you will only be able to view published records. You will not be able to catalogue and edit your own records until you sign in again.